Designed to provide the best 2.4 mm protection, this nextgen 2.4 mm mouthguard is a thin low profile fit design. A slim fit provides ultimate easy breathing and speaking with I-Mold technology for smooth contour and a high level of comfort after forming the mouthguard to each athlete’s unique preference for fit. HMW Composite Blend for increased durability while maintaining fit and performance all season long. 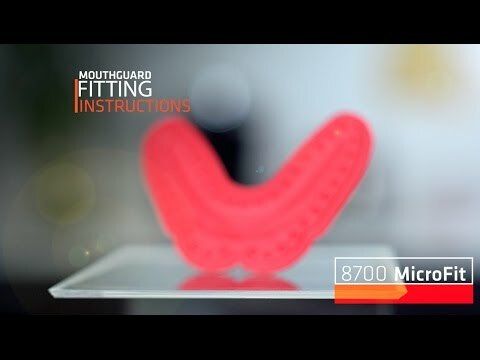 MicroFit Mouthguard is rated 4.6 out of 5 by 11. Rated 5 out of 5 by Andrew T. from Great mouthguard NOTE: If you use Shock Doctor's Mouthguard Case, be careful. Depending on how big it is after fitting to your mouth, it might be small enough to fall out of the case. Happened to my first one; went to the gym after BJJ practice and I kept the case connected to my water bottle but somewhere along the way the mouthguard fell out without me knowing. Bought another one in a brighter color and now I keep it in my bag; no problems since. The mouthguard itself fits great. Might take a few tries fitting to your mouth, but with patience and some retries you'll get it. I use it primarily for Brazilian jiujitsu. Offers excellent breathability, the ability to talk well, and sufficient protection for my particular hobby. Rated 5 out of 5 by John from Great Mouthguard! Using this mouthguard for Brazilian Jiu-Jitsu, so take that as you may. Fitting the mouthguard was a bit of a trial and error. The instructions are clear, but more than likely you won't get it on the first try - don't feel discouraged, this mouthguard is super easy to remold and after a few tries, you will find that this mouthguard will mold EXCELLENTLY to your teeth, as if it were completely custom! Super easy to breathe and talk, drink water, all the necessities! I wouldn't recommend this mouthguard for any super high contact sports like boxing or Muay Thai, where you'll be catching hey-makers or head kicks, but this is perfect for team sports and lower impact like wrestling and of course, Jiu Jitsu! Rated 5 out of 5 by Nathaniel A. from Micro Fit Mouth Piece This is my favorite mouthpiece. I play rugby and the Micro fit is the best for breathing and being able to speak. The mouth piece fits so nicely I donâ€™t have to take it in and out at times during a game. It also fits tightly, it couldnâ€™t possibly fall out of my mouth during play. I have been using the same shock doctor mouth piece for two year, since the 2016 Rio Olympics, and I have never looked back. Rated 5 out of 5 by Doug M. from Thin and it still holds its shape! I love the thinner profile of the mouth piece. Try as I had toi still chewed it in a week. Not a fault of the device, I'm just a real grinder. I did the same with the pieces that my dr gave me for over $250. Rated 5 out of 5 by Anonymous from Super low profile, super comfortable I practice Muay Thai and I really love this mouth guard. I was searching for something that would give my jaw a break from large mouth guards that left me feeling like I actually got punched. Perfect fit was easy to achieve, itâ€™s super comfortable, and you can speak while wearing it. I would recommend it to anyone, and Iâ€™ll definitely be purchasing it again. Rated 5 out of 5 by Nancy L. from Best Mouthguard Ever This is by far my favorite mouthguard that I have ever owned. It comes flat, which means that you get to shape it exactly to your mouth. You can talk comfortably without removing it, and it's easy to breathe when it's in. I recommend this mouthguard 100%! Rated 5 out of 5 by Joe Christian from Great Mouth Guard I bought this mouth guard for roller derby and I am very happy with it. I find it very similar to the Sisu, but it is actually more comfortable, and lightly less expensive.